The EU has launched a campaign aimed at showing how low-carbon solutions can improve quality of life. The European Commission believes that policies to cut greenhouse gases will only work if individuals share the vision of a low-carbon society. "It's perhaps been a bit too much doom and gloom in the past on climate," one official told the BBC at the launch in London. "We are now emphasising the need to inspire people." The EU-wide campaign runs until 2014. The campaign title "Worldulike" will doubtless raise eyebrows. The name is uncomfortably reminiscent of the British baked potato restaurant chain Spudulike. The vision is being transmitted through the Commission's website world-you-like and also Facebook and Twitter. These will create space for positive examples of tackling climate change throughout Europe, including schemes to use excess body heat from one building to warm another (Sweden); allow neighbours to use your car (UK); and generate energy from landfill (Latvia). Experts in media and marketing have criticised politicians in the past for failing to show people how climate policies could make their own lives better in the short term, as well as reducing planetary risk in the longer term. The EU Climate Commissioner, Connie Hedegaard, said climate policies would cut local pollution, reduce dependency on fossil fuel imports, improve resource efficiency, save money on energy and even make people fitter if they left their cars at home and cycled to work. Critics will argue that some of these claims are contestable, but Ms Hedegaard told BBC News: "If we are defeatist over the climate we will get nowhere." "There are many good solutions out there that other people can learn from. Climate change policies create jobs in Europe in renewable energy and retro-fitting - these aren't jobs that can be exported. 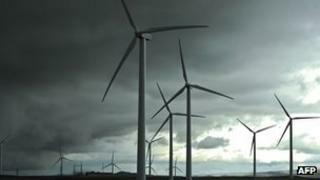 "The UK has enjoyed massive growth in the green economy with 110,000 green jobs. Climate change policies also help us reduce our imports of fossil fuels and help to give us the lead in smart technologies as resources become more scarce." She said awareness of climate change varied widely throughout the EU. One of her officials admitted that the UK was suffering from something of a media backlash against climate policies because previously there had been media "overkill" on climate. But in some other countries - particularly in southern and eastern Europe - climate was not widely discussed. When asked whether at a time of recession countries should seek the cheapest forms of energy possible to stay competitive Ms Hedegaard replied that this would result in the EU missing its climate targets. She said she believed a new global climate agreement might be achieved in 2015. "That would be the first time that rich nations and developing nations signed a legally binding agreement for everyone to reduce emissions - a huge breakthrough." She admitted, though, to great uncertainty over the negotiations in the short term, with coming leadership changes in the US and China. Asked whether she was supporting President Barack Obama's re-election, on the grounds that his policy on climate change might be more amenable, she replied: "I'll work with whoever Americans decide to elect."